Mountains have personality. We forget and all is forgiven, even when they are cantankerous, belligerent and vile. 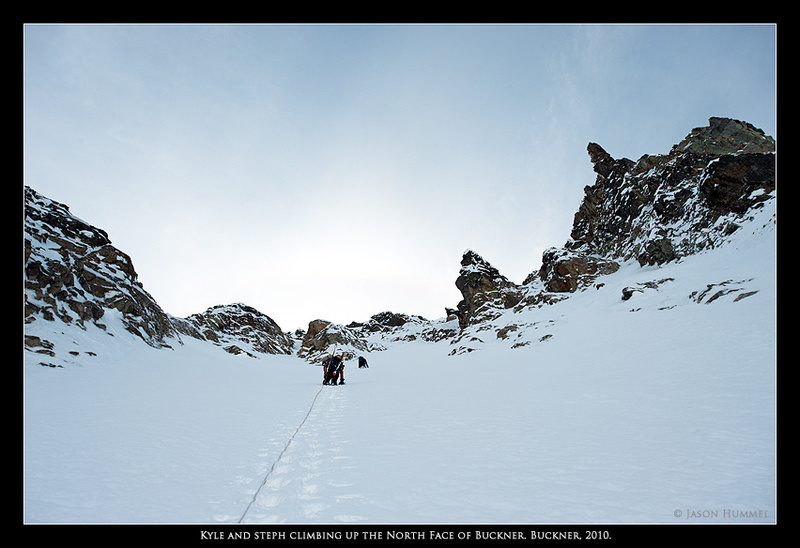 The pretty face and homely smile, seductive pull and salacious dress of rock and ice excite us climbers too much to turn away and never come back. But there, too, are so many mountains. Just a fraction of them you may visit in a lifetime! So when I do go, it isn’t with a heavy heart thinking that I may never return, but with great respect and honor that I go to meet these elders of stone and earth. They teach us lessons and reward us in ways that the confines of brick and mortar can’t. New friend and fellow mountain photographer, Steph is ready when I pull up to her house in Seattle at 4 a.m. We quickly proceed to a nearby park-and-ride where Kyle is waiting. Everyone is excited. The weather appears promising. Stories and conversation carry us all the way to the end of Cascade River Road, where the final few miles are blocked by a gate. 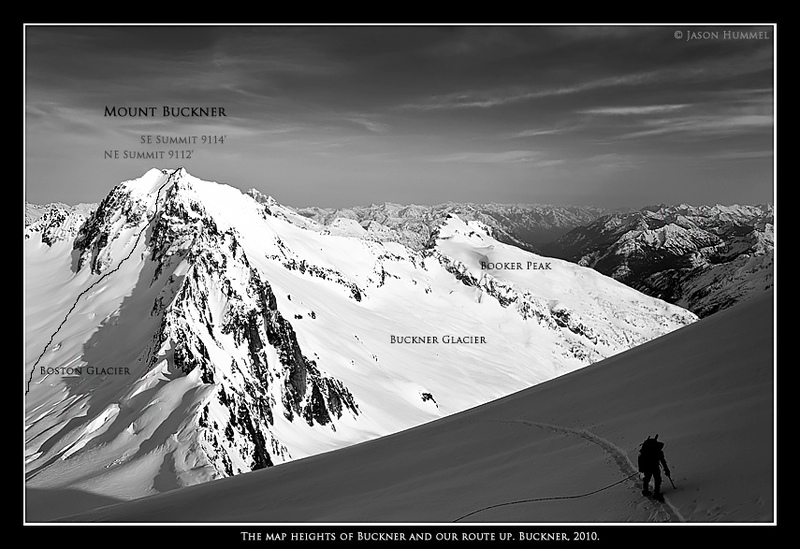 We can not see our objective, Mount Buckner . All that is visible among vine maple, willows and firs is Johannesburg ’s vertical mile of rock and ice. Imposing as it is, such dominance steals an otherwise sunny morning. Those rays are for creaking joints and aching shoulders to earn. 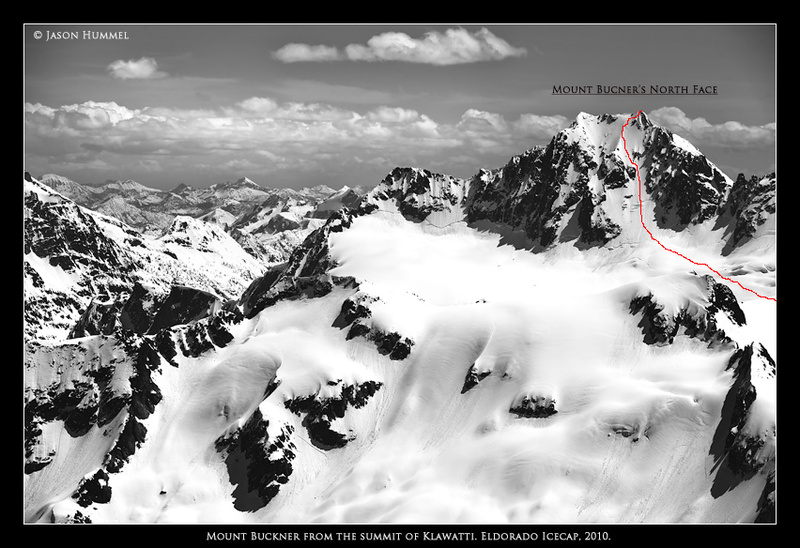 Such required efforts are why I love North Cascades National Park so much. It isn’t for the roadside tourist and R.V., but for those willing to pay for their rewards with sweat rather than oil. 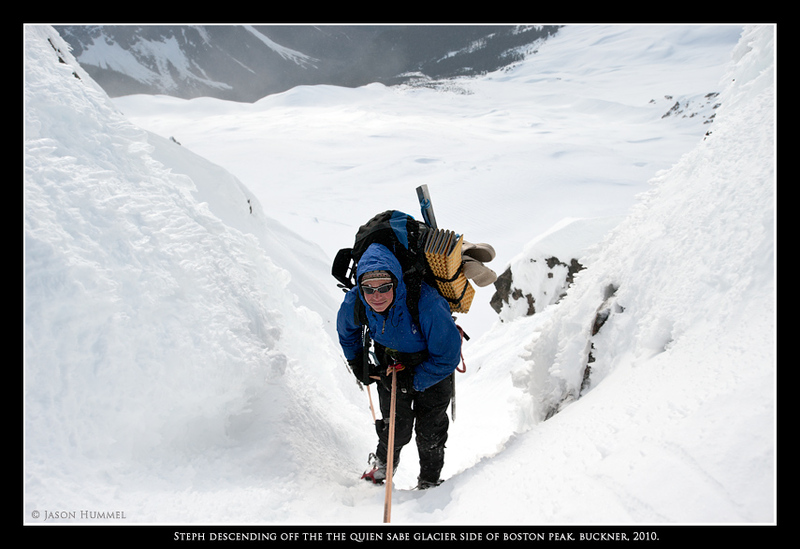 Unconsolidated snow on a glacier, especially the Boston , the widest glacier in the lower 48, convinces us to rope up. Every dip and swale, shadow and curve hides a potential monster beneath snowy covers. Repeatedly I decide which way to go. Up, down, or straight? And now my brain fires off an answer, “Straight.” As I push through the snow, a tiny shadow I hadn’t seen glares at me. “Oh no!” I think. Between my feet everything begins to crumble. 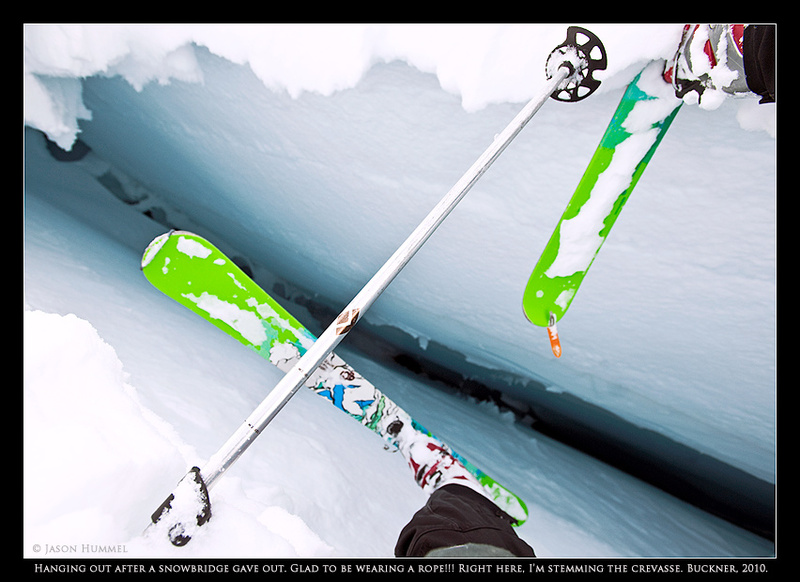 My skis catch the far wall as my back slides backwards. 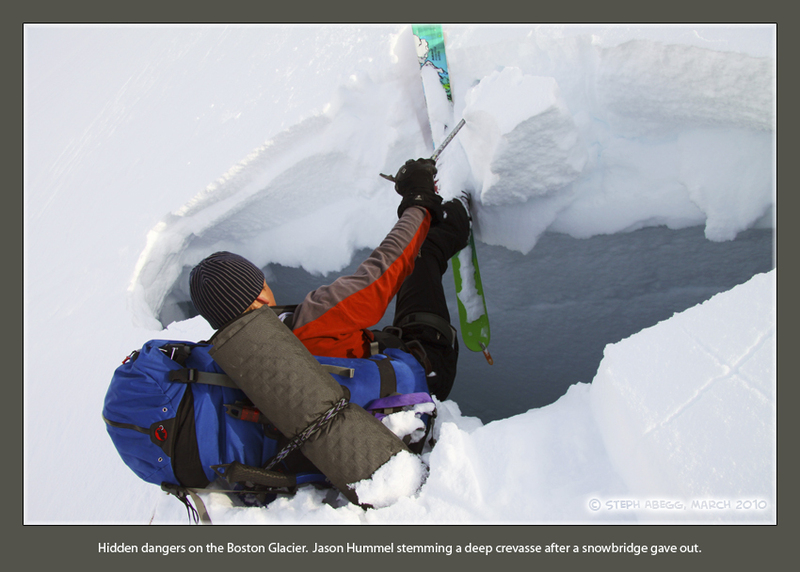 Blocks of snow disappear past a narrowing in the crevasse 50 feet below. After a moment to gather myself and yell behind me, “Kyle, anchor me…can you have Steph come forward?” Several minutes pass and I begin to feel comfortable, so I pull out my camera and take a few photos. Moments later with further tension on the rope from Steph, I am able to wiggle out. After brushing snow off, I’m soon back on my skis and in the lead once again. My decision this time when I ask myself “up, down, or straight?” “Left,” because down is a bad choice of words. One lesson I relearned is the importance of always keeping the rope tight between you and the guy in front. I weigh 160 lbs and my pack and gear another 60. Imagine standing on a 10 story building with 220 lbs strapped to you. If the rope is tight and it falls a foot or two, you can hold it. Imagine then a guy standing on the buildings edge with that same 220 lbs with 10-ft of slack. Could you hold it when suddenly without warning (an hour, 3 hours, or even15 hours into your day) you look up and don’t see anything? 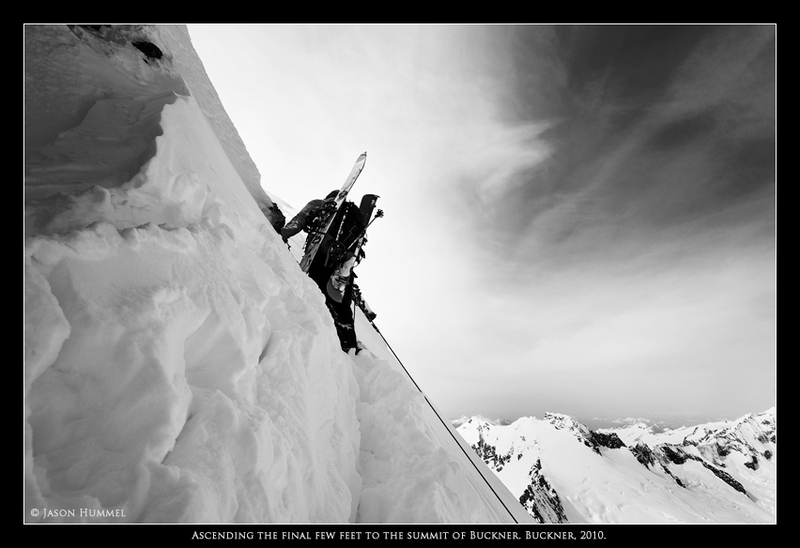 Now that’s something to think about when you’re roped up on a glacier again! On a nice overlook of Mount Buckner, we make camp. 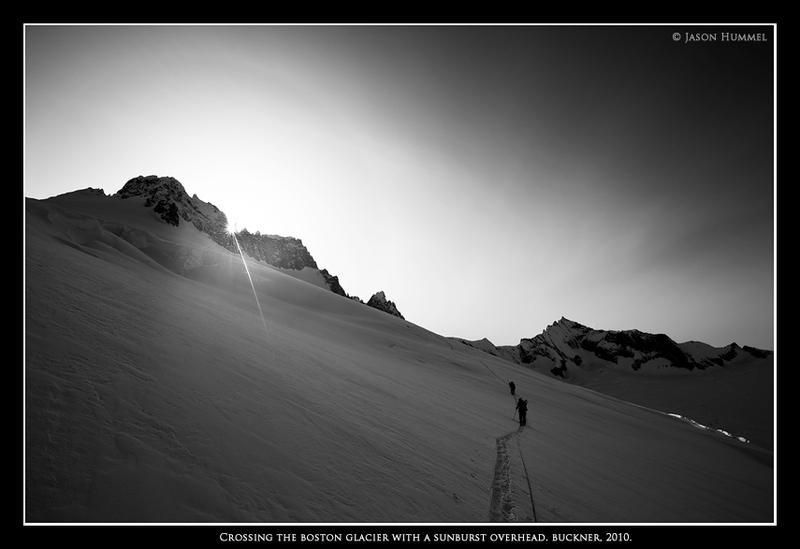 The sky is hazy and wind is beginning to drive snow down the slopes into our camp where eating and melting water takes a few hours before we all drift off into a restless sleep. There’s nothing like waking up repeatedly to slapping layers of tent. It’s like trying to fall asleep next to a rocket engine! 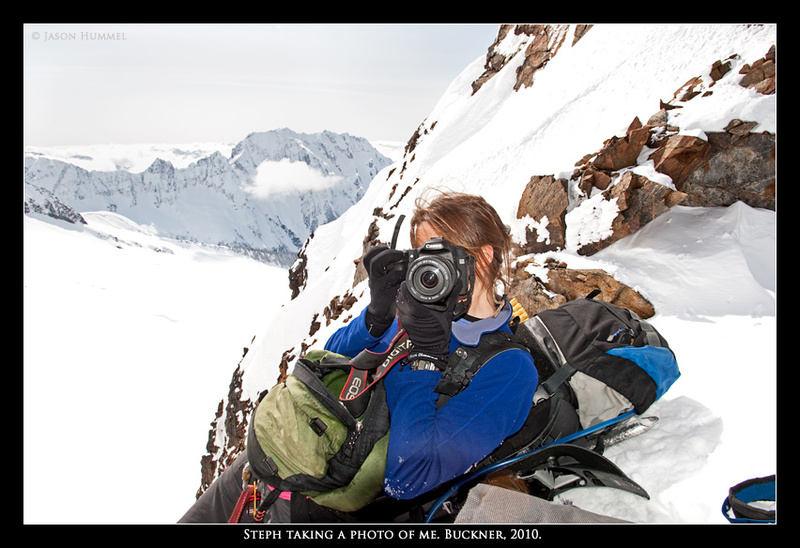 Nine hours later, I awake to Steph photographing first rays on Buckner. Even if it was a lackluster sunrise, it’s better than none at all. 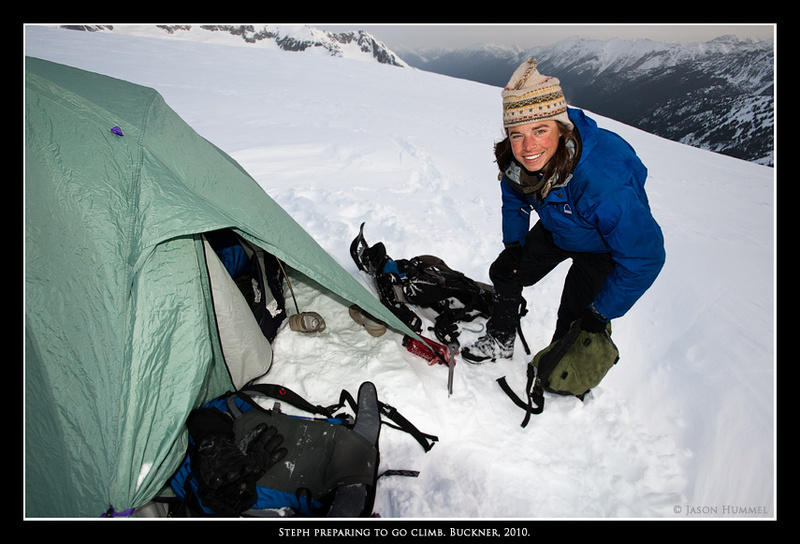 That morning on our second day, two feet of wind deposited snow covered our tent and gear. After digging it all out, we start upward. Not until that moment do I realize my sunglasses are gone. It appears the crevasse didn’t come away empty handed! 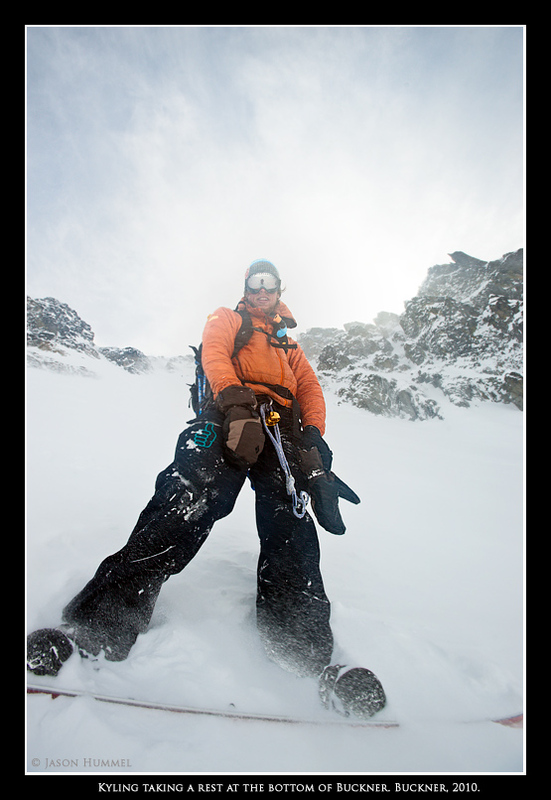 Staying low, I cross beneath the lower schrunds to the base of the North Face where we put on crampons and take out axes. 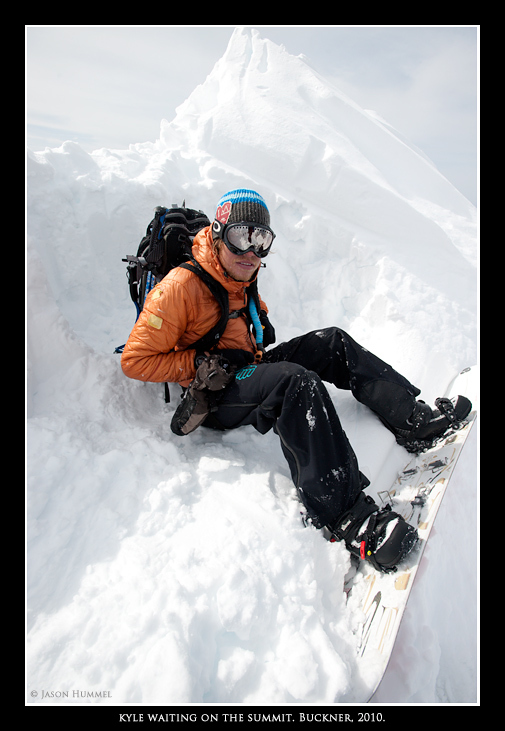 Since Steph is ready first, she takes off in the lead up wind-buffed powder. One thousand feet higher she passes a rocky constriction on the left and soon after, on the lee side of a cliff, she pulls up for a rest. 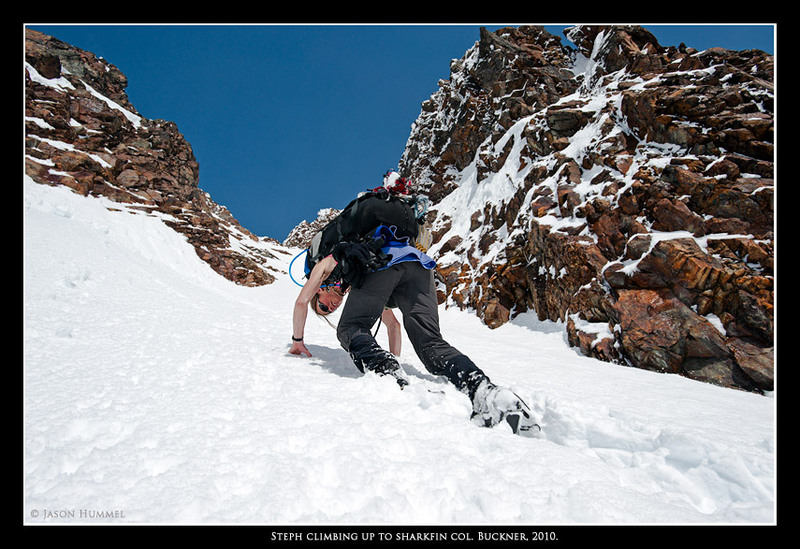 After a drink she says, “Jason, you want to lead?” Since we are only a 100-ft shy of the summit I reply, “No, you should finish it off.” I know I feel excited when I lead an entire route. Once her pack is on that’s what she does, quickly disappearing over the slope and to the summit ridge beyond. 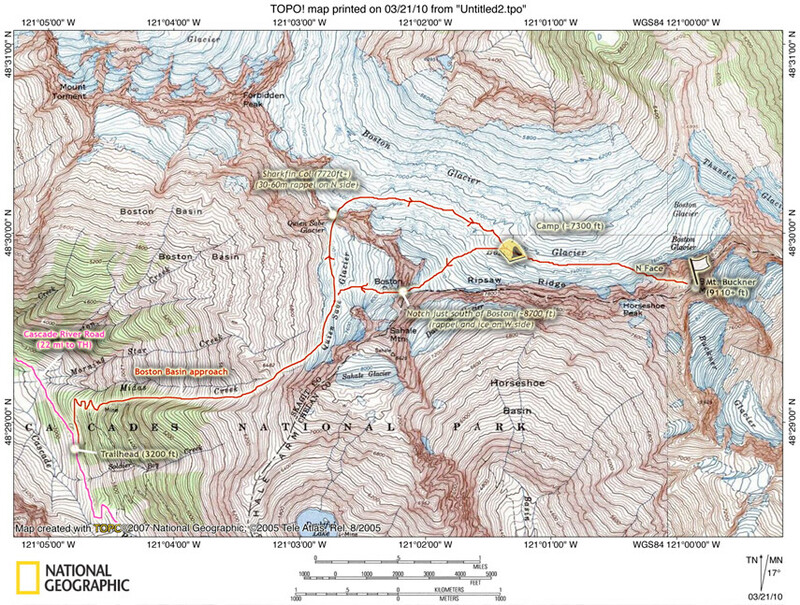 On the maps Buckner’s NE and SE summits are shown as 9112’ and 9114’, respectively. Still, there’s a valid disagreement as to which is higher. From our perspective the NE summit did appear taller. 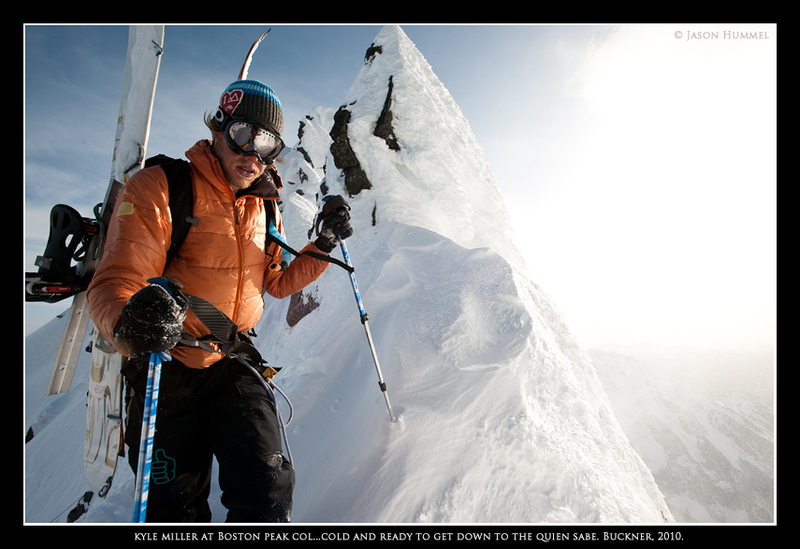 All aside, though, as a skier I’m more interested in fall-line. 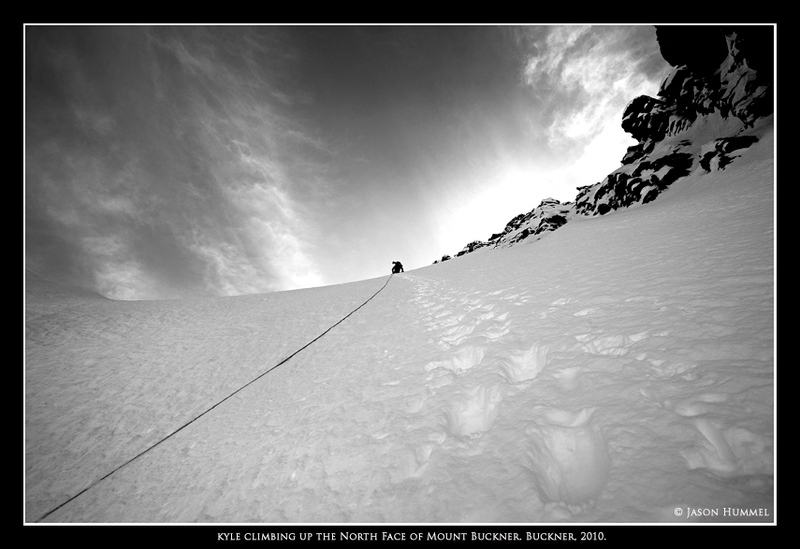 So, for us, the SE summit is the only way to descend the north face. 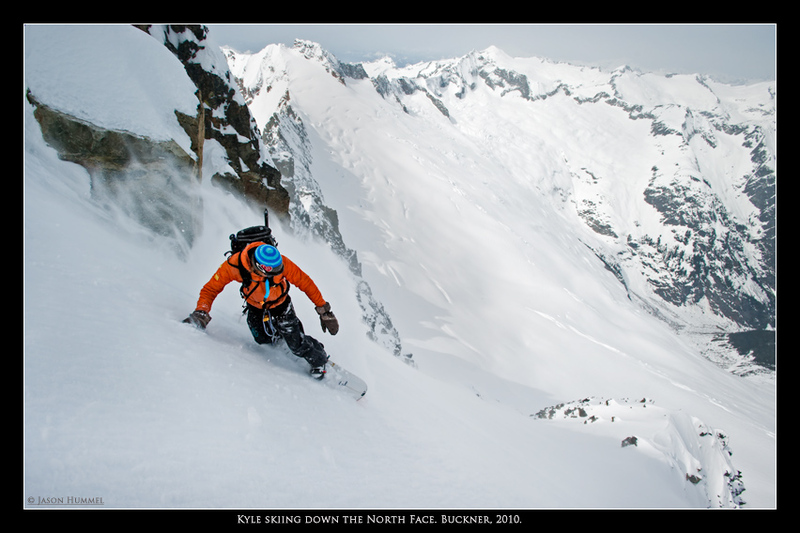 The same can’t be said for the North Face Couloir and when I come back to ski it, I’ll descend from the NE summit. While my partners prepare for descending I continue to the SE summit to find a flat spot on which I could transition to skis. Doing a balancing act, I teeter trying not to slip in either direction. Wind pushes me one way then the other, and neither direction would have a happy ending. 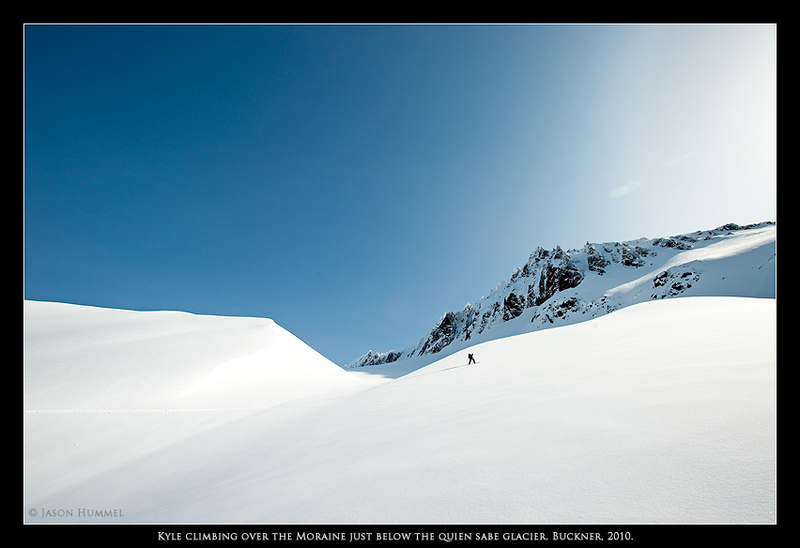 Steph comes over and back before I glide to Kyle who has built a huge platform to put his splitboard together in. Knowing she would be far behind, Steph, who is without skis or board, downclimbs out of sight while I stand in chilly gusts and wait for Kyle. 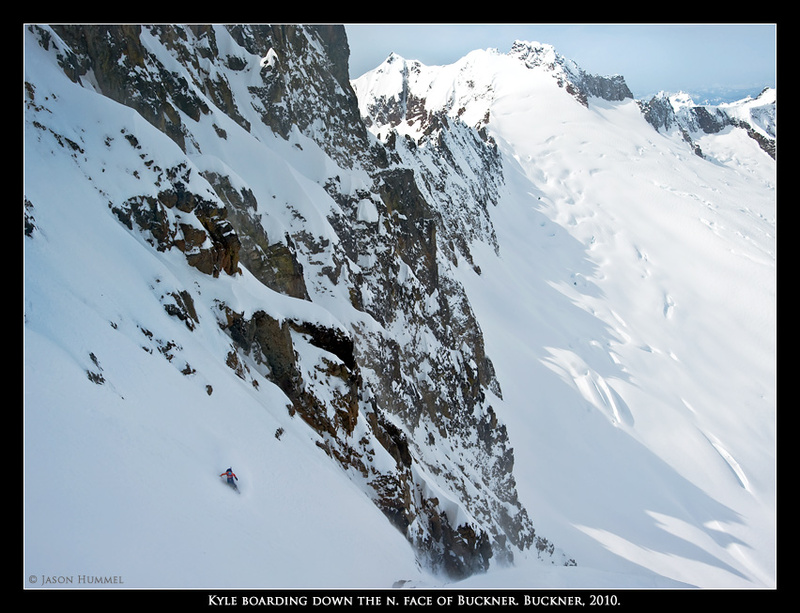 A satisfying first turn traverses me onto the face and Kyle follows. From the far ridge, which had blocked the wind all morning, fingers of snow and ice rip across, swirling and churning as watery rapids will. They whirl and stall in eddies before spinning out of control on top of our heads, which drip and freeze at the same time. Between this chaos, we drop a few turns at a time until we are in the middle of the route, at which point we wait as Steph climbs out of the way. 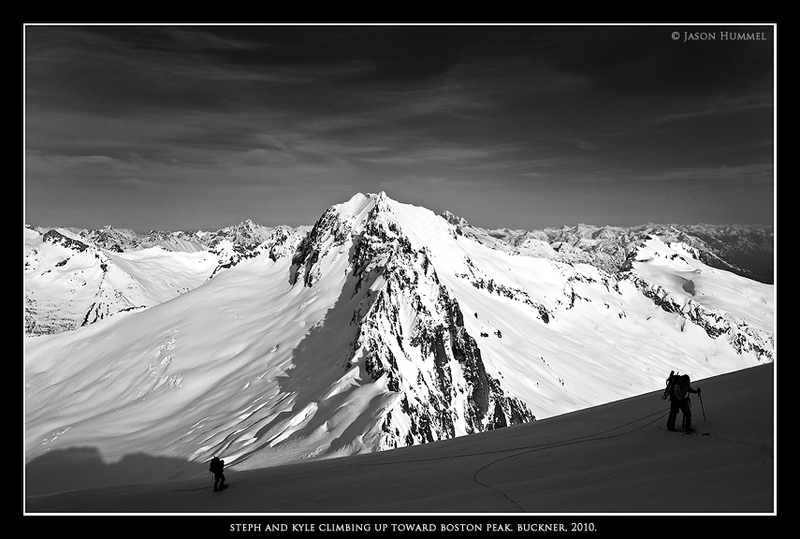 Here the wind lessens and the turns just improve all the way to the bottom. What a descent. What a route. 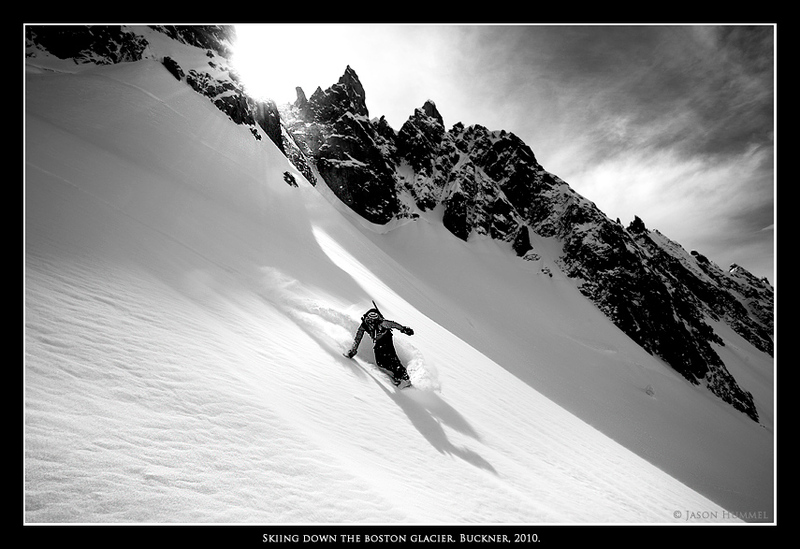 After a decade of dreaming about it, I finally came and skied it – awesome! 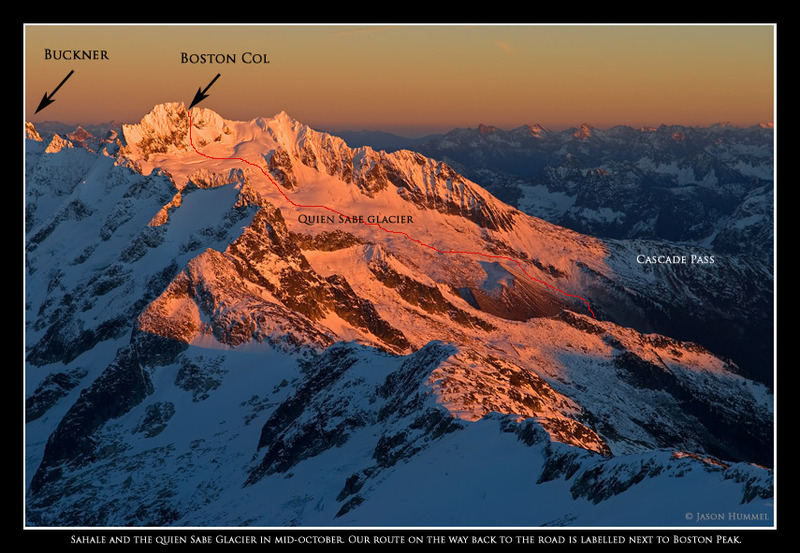 After sorting camp, we decide to climb over Boston Peak ’s 8500-ft col rather than Sharkfin col, the way we had come. It takes much longer to climb up than I expect and the upper slopes are getting hit hard by wind. At a point where I am about to reverse course over concern about stability, the snowpack solidifies and we boot the remainder of the way to the notch. I love it when a fine line of safe decisions leads to success. After setting a picket, Steph descends out of sight and to the end of the rope. I belay her another 25 meters from there. Next up is Kyle. He decides he is going to keep his snowboard on. Just as he drops out of sight, I hear him say something like, “It looks good.” The wind is too strong to catch much more than that. A few moments later, the rope goes slack. He went without a belay. 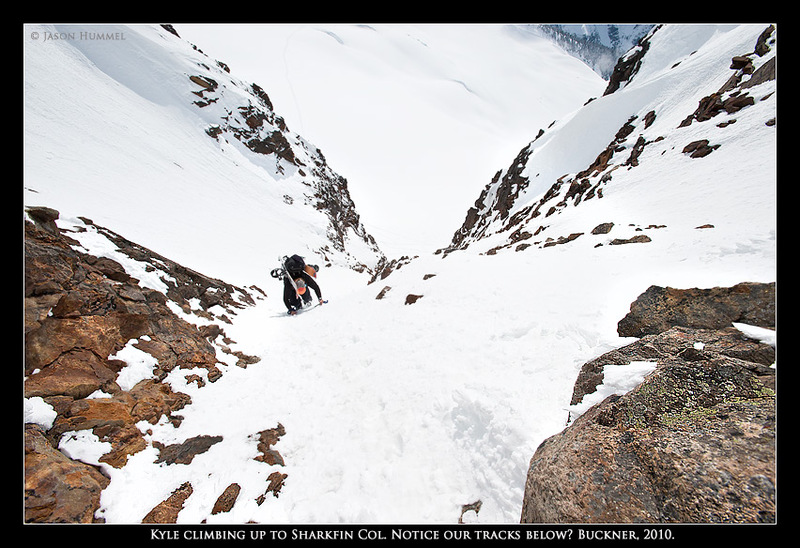 Figuring since he boarded it, I’d be fine with skis as well, I attach mine to my feet and drop into the couloir. As I get closer and see what Kyle had descended, I shake my head in wonder. 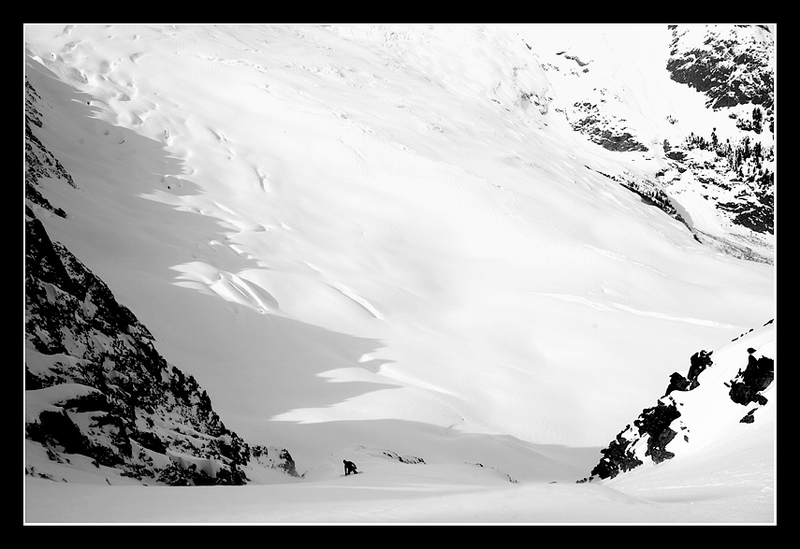 Snowboards can side-slip some serious stuff! There was an inch of ice over a foot of granular snow with rock beneath. 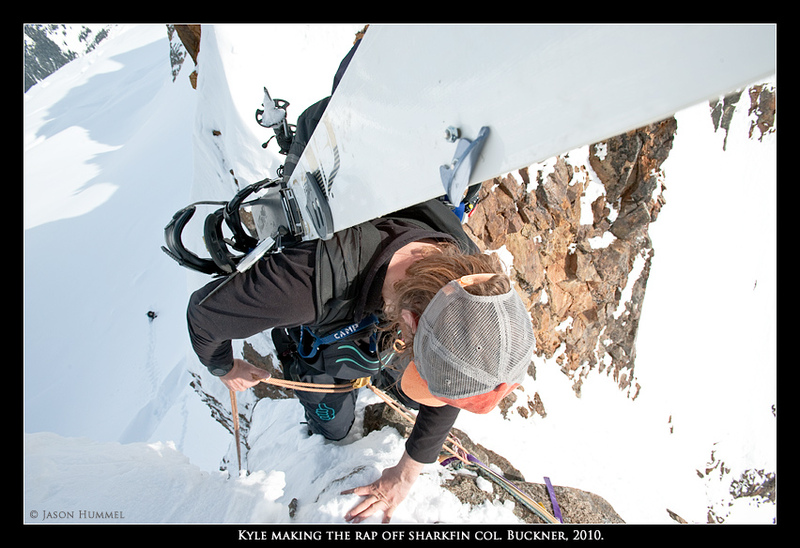 I hung from my knots at the end of the rope below a small cliff while I took my pack and skis off, pulled my axes and pons out, and put everything back on, a process that took over 15 minutes of cautious work. All the while I’m getting pelted by falling ice and buffeted by wind. Overall, a most unpleasant experience! 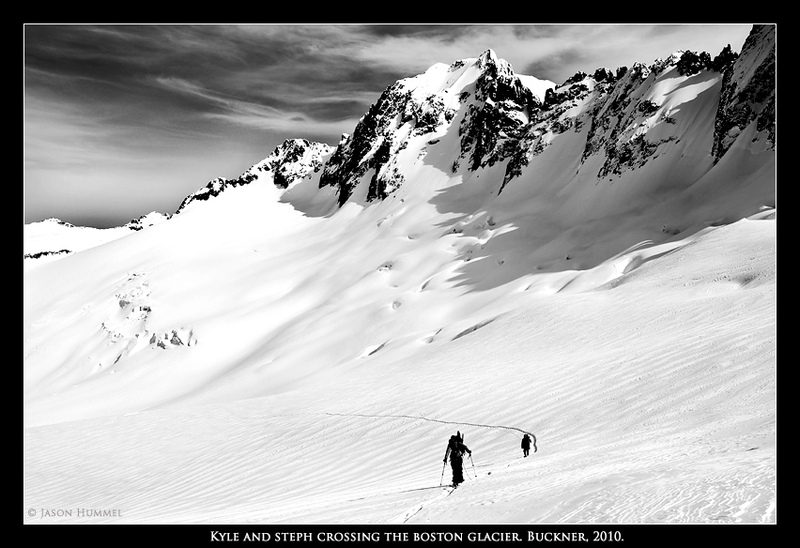 Happily I descend far enough to coil the rope and put my skis on, so I could drop down to Kyle who is very glad to get going. There wasn’t much light left by then. Steph is already 45 minutes ahead of us. 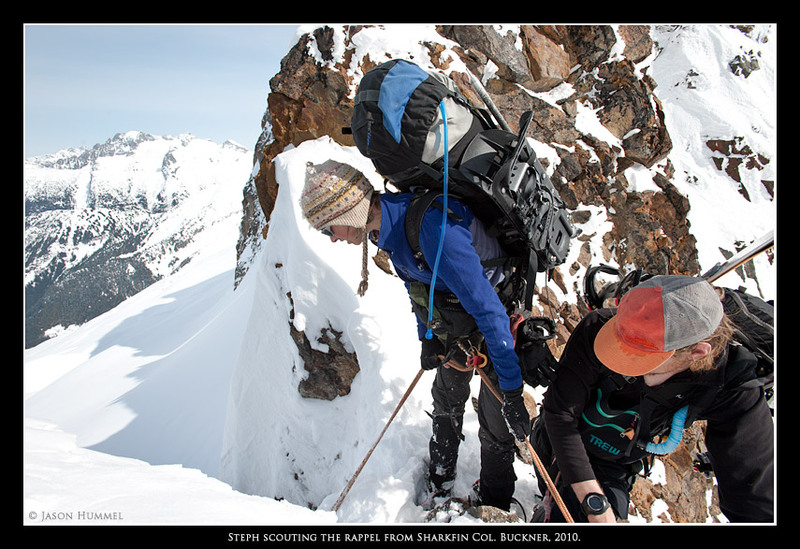 As we stormed down the Quien Sabe Glacier with 5000-ft to go and 10-minutes of light left, I am already forgiving Buckner for her tormenting of me. 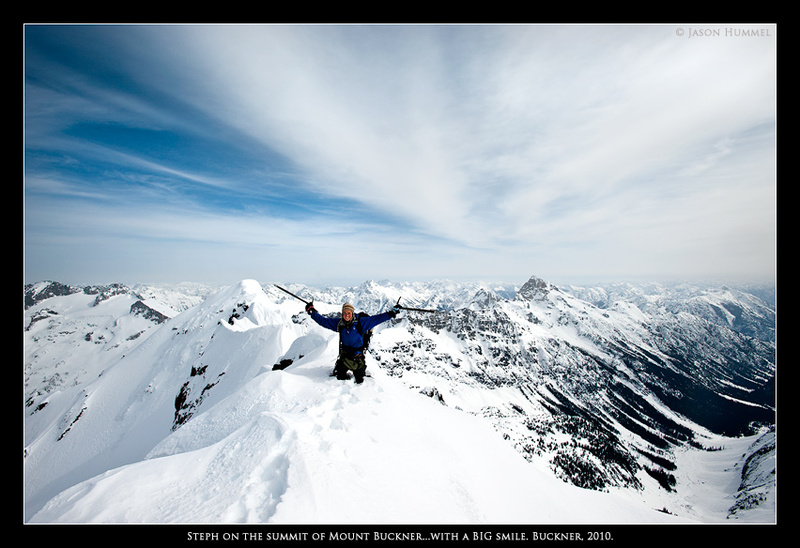 In these mountains, there are those who find the rewards far outweigh the risks. For me, these adventures are the great eraser. There’s nothing but the moment to battle and all worries and concerns are rubbed out because they are of no consequence here. Even as night pulls up her covers and we pull out our headlamps, we understand the value of challenge in a world that continually seeks out ways to make life easier. The last few miles battling through brush to Cascade River Road and renewed sights of Johannesburg’s great walls fills me with joy all the way back to the car and civilization. Here's a link to Steph's report: LINK.